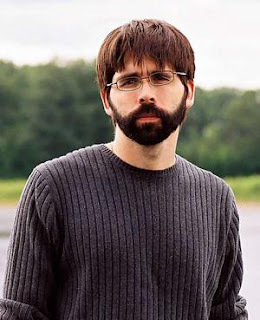 I’m not typically one to sit at the computer and listen to a podcast but when I heard that comic book writer, Eisner winner and novelist Joe Hill was making an appearance on Comic Book Live in NYC last night, I all but had to tune in. Comic Book Live is an interview show that features in-depth discussions with industry professionals along with engaging segments like "The Stack" in which the cast reviews weekly releases and a trivia game that challenges audience members to answer goofy questions, sort of like a “Wait, Wait Don’t Tell Me” for comic book geeks. Joe Hill sat down to answer a few burning questions from the fellas at Comic Book Live in Fontana’s Bar, somehwere in the heart of Chinatown - and a gaggle of comic book nerds rejoiced. Hill revealed his thoughts on writing, how he broke into the business, his professional “bromance” with Gabriel Rodriguez, why he thinks Chronicle is the best super hero film ever made and what he’s got coming up next. Upon being asked how he came up with the idea for Locke & Key, Hill weaved the tale of his big break into the comics industry with the dexterity of a rock climber leaping over deep crevices of interview patter and rowdy audience interruptions with the fluidity of a practiced and thoughtful storyteller. "I had spent three years writing this novel, a big epic fantasy, which became a huge international best seller … in my imagination. But in real life it was turned down by every publisher in New York, it was turned down by every publisher in London and as an extra kick in the pants, it was turned down in Canada. So I had completely washed out as a novelist. I had had some success with short stories and I managed to break through with this one short story that got some best of collections which then attracted the notice of a scout at Marvel." Joe continued on to describe how he eventually got a chance to do an “audition” piece for Marvel on Spiderman Unlimited, which he quipped was “the worst piece of garbage I had ever written in my life” yet somehow left him inspired to write further and better comic book scripts. Even though his original attempt at penning a successful script was a “failure,” he returned to Marvel and pitched a “weird Haunted House story which was kind of like this house with all these mutant keys.” Interestingly enough, Marvel passed on the idea but Joe said that he couldn’t forget the story. "Months passed and I would keep thinking up new keys and new ideas about this house. And eventually I had a novel come out called Heart Shaped Box. Around the same time it came out, IDW contacted me and said we’d love to do something with your short stories. We’ve had luck adapting short stories by writers and I said ‘Wait, don’t adapt my short stories, let me pitch you on something else. I’ve got this great idea for a haunted house story that will last exactly six issues.’ So, that’s how Locke & Key got started." "What Gabe did was, he drew people who were sort of adorable. And I thought, this is the guy I want. I think a lot of people misunderstand how horror works, I think that they think if you just throw enough entrails at the reader they’ll be scared. I’m all for entrails, ya know, I’ve got no problem with that. But I think that you have to care about the source of the entrails first. You have to identify with a character and love them and care about them and then it really hurts when they’re hanging from a meat hook." Joe described his relationship with Rodriguez as “an old married couple, where I start a sentence and he finishes it,” claiming that it’s almost as if together they shared a “unibrain” in the creation of Locke & Key. When prompted to discuss the end of the series, all Joe could muster, with the trepidation and excitement of an author near to the end, was that he hoped they can, “stick the landing." "I don’t want it to be like the wet fart in the bathtub at the end." "There are two kinds of writers, there are writers who are architects who plan and map and they know everything that’s going to happen and then there are writers who are gardeners who plant things and they kind of know what they’re going to get but they don’t know exactly how it’s going to grow ... That’s always been my philosophy, I always feel like I’m going to create the situation, I’ll have the characters there and then they will organically find their way to the end." With regards to his female readership, Hill felt quite strongly that Locke & Key has done well not to “slam the door” on the lady readers. 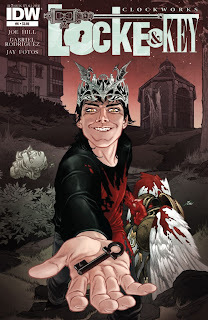 Later in the interview, Joe revealed a few of his upcoming projects which include the release of Locke & Key: Grindhouse, a throwback to the crime comics of the '50s and '60s, a couple of stand-alone comics set in the L&K world, a new novel and tentatively suggested a superhero story in the works with one of the top two publishers but about whom and what he was cautious to reveal. Listeners also learned that Scott Snyder once performed at Disney World as an Elvis-themed Buzz Lightyear and that Chronicle is the best super hero film ever because of the talent show scene. Overall the interview was a joy to listen to, especially for those of us far from the Big Apple. I so enjoyed my time, that I was even forced to reconsider my previous reservations about tuning in to a dreaded podcast. They aren’t all so bad, you just have to know which ones to follow like Comic Book Live…especially if Joe Hill is in the house.